Keeping sharks in million liters tanks has become a ‘must’ to attract a lot of visitors to an aquarium. For example, the famous Georgia Aquarium is a public aquarium in Atlanta, Georgia, USA. It houses several thousand species, all of which reside in 10 million US gallons of marine and salt water. For long it was the largest aquarium in the western hemisphere. But then in 2012 it was surpassed by Marine Life Park in Singapore. Both aquaria also have sharks swimming around behind large panoramic windows, creating for the visitors the impression that they are actually among them in the ocean. They are also the place to take your kids to in the week-end. They will love it, watching the sharks while clutching daddy's or mummy's hand. But many species of sharks don’t seem to do very well in captivity. One factor could be the stress of transportation. Restricted space could also play a role, although modern saltwater aquariums have a great deal of room to move around. Nevertheless, many sharks end up dying within a year after their capture. Even the species that are released after a while in the open sea have difficulty with surviving longer than one year. Best chances for survival have smaller more docile sharks like catsharks and nursehounds and epaulette sharks. Probably beacuse these species are more territorial. And even some larger species like sand tiger and leopard sharks. Some of the geater aquaria also managed to keep tiger sharks in life for several years. 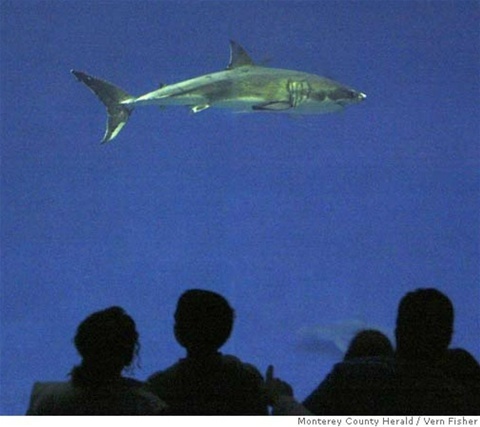 Why do sharks do not well in captivity? Like the goldfish in the litte pond on my balcony, some of which must now have reached the age of twenty years, and still seem to enjoy their little biotope. This is their world.